Requirement is to insert/update SAP records in non-sap system’s Oracle Table. To achieve this, we create a Proxy-to-JDBC Asynchronous Outbound Scenario in SAP-PI. In SAPEcc, one ABAP function module is required to extract data from sap-table and pass it to PI-Proxy-structure and invoke the SAP-PI-Proxy. 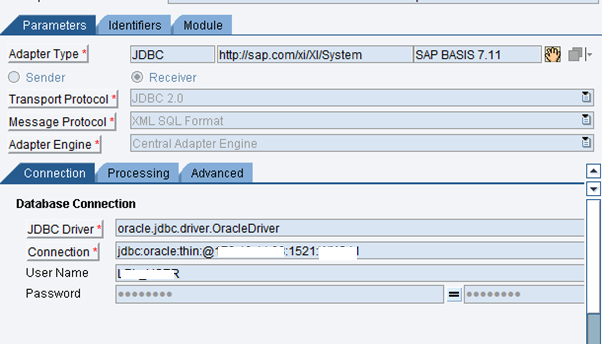 Scenario is called as SAP-PI’s “Proxy-to-JDBC Asynchronous Outbound scenario”. Its not required, because it’s a proxy scenario which class will be invoked from SAP-ECC. Enter the new column values in the <access> block. Enter the condition under which the table values are to be deleted in one or more <key> elements. Column values within a <key> element are combined with a logical AND. different <key> elements are combined with a logical OR. Note: If no condition is specified, then entire table gets deleted. In the <key> element, enter the condition that can find the data records whose column values are to be changed. We use an UPDATE_INSERT statement to change and add table values. 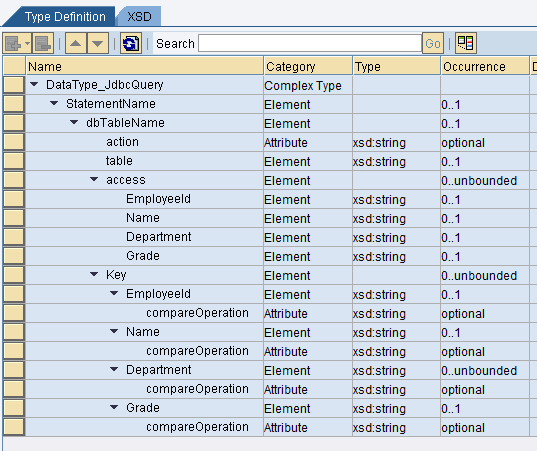 Request-Map will help to convert Dynamic-data-query into and message format of SELECT query supported by JDBC-Adapter. Response-Map will help to convert JDBC-returned message output into custom-business-format. Note: JDBC Adapter returns above message format having Message-type-name same as of request with postFix ‘_response’. LIKE Like (strings). In the corresponding value, the SQL placeholders “%” or “_” can then also be used. 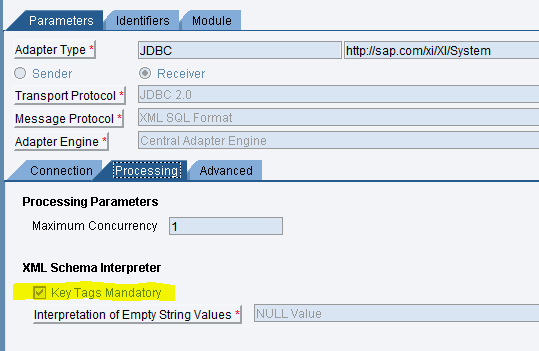 To avoid query operations without conditions, then select ‘Key Tags Mandatory’ in the adapter configuration.